Hortus Camdenensis | Rosa laevigata Michx. A vigorous species with large prickles, attractive, glossy, trifoliate dark green leaves and solitary, flat, single, scented white flowers in summer, to 10cm across, with scalloped petals and golden stamens, followed by bristly, orange-red hips. [Gore, Rivers (1854, 1857), Willmot, Don]. It was introduced into North America in the 19th century and readily naturalised there, hence the common name of ‘Cherokee Rose’. ‘This has been cultivated in the gardens of Georgia for upwards of forty years under the name of the “Cherokee Rose”, but its origin is still obscure. In our rural economy this plant will one day become very important. For the purpose of forming hedges, there is perhaps no plant which unites so many advantages; and in quickness of growth, facility of culture, strength, durability, and beauty, it has perhaps no rival.’ [Elliot, Flora of South Carolina and Georgia, quoted in BM t.2847/1828]. 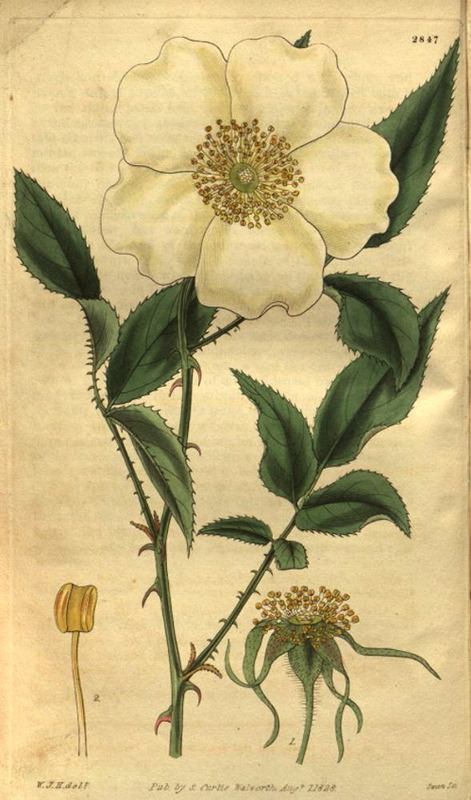 Rivers includes this rose among the Banksian roses and speculated that the Chinese developed the double Banksian roses from Rosa sinica. Listed in all publiahed catalogues [T.854/1843]. Possibly introduced by Macarthur to tests its possibilities as a hedging species. More details about Rosa laevigata Michx.